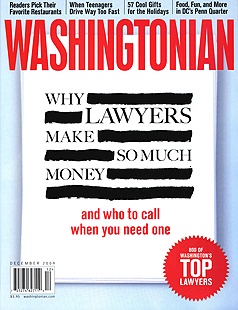 Washington has lots of legal talent in every practice area. To help answer the question "Who are you going to call?" we have compiled a list of top lawyers in legal specialities that readers are most likely to need. The first includes lawyers from Rockville to Woodbridge. It includes attorneys that can help if you need a divorce, have a brother that has been arrested or a grandparent with Social Security problems, or wake up and find your name splashed across the front page of the Washington Post. Washington creates unusual legal problems. You never know when you or your employer is going to become the subject of a prosecutor's interest or a congressional hearing. To complete this list we contacted hundreds of attorneys in each of the specialities and asked which lawyer in their field--other than themselves--they would trust with their business. Lawyers with the most recommendations made the list. Lawyers are listed under the categories for which they are best known, but their practices are often much broader. If your situation doesn't seem to fit any of the categories given, find the one that sounds most like what you need and start calling. If you reach a lawyer who can't help you, he or she usually can refer you to someone who can.